A new study has shown that galaxies with the most powerful, active, supermassive black holes at their cores produce fewer stars than galaxies with less active black holes. Researchers compared infrared readings from the Hershel Space Observatory with X-rays streaming from the active central black holes in a survey of 65 galaxies, measured by NASA's Chandra X-ray Observatory. At lower intensities, the black holes' brightness and star formation increased in sync. However, star formation dropped off in galaxies with the most energetic central black holes. Astronomers think inflows of gas fuel new stars and supermassive black holes. Feed a black hole too much, however, and it starts spewing radiation into the galaxy that prevents raw material from coalescing into new stars. Supermassive black holes are believed to reside in the hearts of all large galaxies. When gas falls upon these monsters, the materials are accelerated and heated around the black hole, releasing great torrents of energy. In the process, active black holes often generate colossal jets that blast out twin streams of heated matter. Inflows of gas into a galaxy also fuel the formation of new stars. In a new study of distant galaxies, Herschel helped show that star formation and black hole activity increase together, but only up to a point. Astronomers think that if an active black hole flares up too much, it starts spewing radiation that prevents raw material from coalescing into new stars. This artistically modified image of the local galaxy Arp 220, captured by the Hubble Space Telescope, helps illustrate the Herschel results. 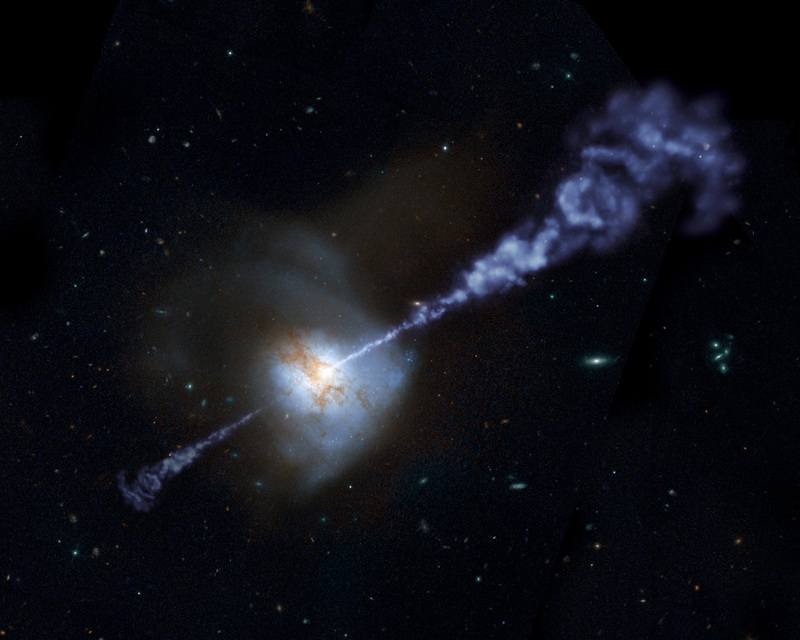 The bright core of the galaxy, paired with an overlaid artist's impression of jets emanating from it, indicates that the central black hole's activity is intensifying. As the active black hole continues to rev up, the rate of star formation will, in turn, be tamped down in the galaxy. Astronomers want to further study how star formation and black hole activity are intertwined. Coordinates (J2000) RA 11h 34m 57.1s | Dec +23° 30´ 12.00"
I think that many of the amazing and mysterious secrets within black holes can be solved by pictures based on the waves like in example eyes of our planet smart and pretty Oaks ... Warm regards to look at those pictures !!! I am only computer science graduated student. The galaxy with higher activity and less central stars could not suggest a "division" or "birth" of a new galaxy?